Your essential Canon EOS 6D Mark II camera field guide in a convenient pocketable style. 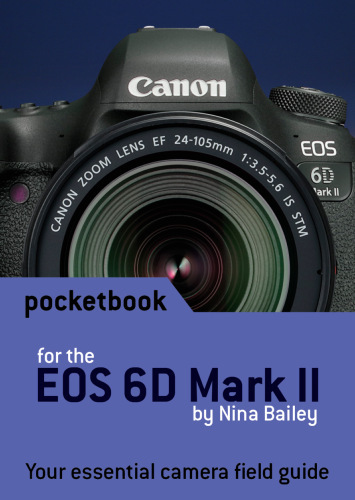 This EOS Pocketbook for the 6D Mark II is a concise guide to your camera and small enough to carry with you everywhere. Nina Bailey, Technical Editor of EOS magazine and author of the popular EOS eBook series, has the solution. This new Pocketbook for the Canon EOS 6D Mark II is a concise guide to the most used and confused features and controls on your camera, based on Nina’s vast experience as lecturer at EOS Training Academy – hearing first-hand what photographers want to know and understand about how their EOS 6D Mark II camera operates. What I needed. Wished for a quick guide to setting in something other than manual-speak. This fills in the gap. First class product great value. Great little book..Great size to carry in your camera bag..Very pleased.. Excellent bit of easily carried kit to refresh memories at appropriate times when out and about. Well laid out, easy to read, just what I needed. Nice little book to find information. Having bought my 6D Mark 2 recently I was so disappointed to find there was no manual - only one to print out online.This was no use to me. I needed one to ' hold my hand ' while I am learning what this camera does. I have now found the answer. This little book is brilliant to carry in camera bag . It is so useful and handy to have for those times when you need advice on various settings, menus etc. So pleased that I bought this. Handy size when out and about.